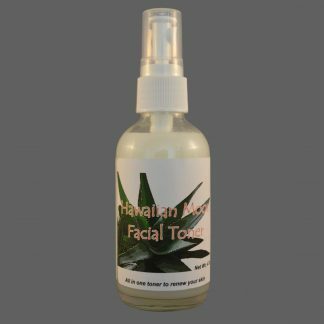 Hawaiian Moon Aloe Vera Family Pack Special - Heal your dry skin! Suffering from a dry skin condition? Are your hands constantly dry or have problems finding a great moisturizer? 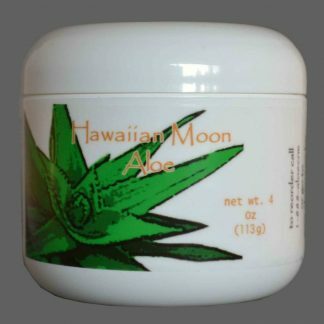 Our customers have reported improvements by using our Hawaiian Moon Aloe vera skin cream for a variety of skin ailments. These range from eczema, psoriasis, rosacea, dry skin, cracked hands or feet, ashy skin, sun burns, abrasions, and more! 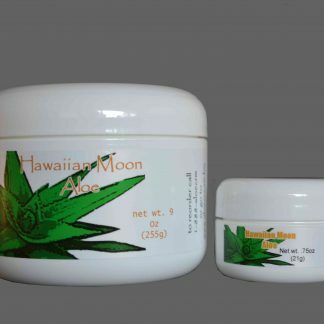 Our Hawaiian Moon Aloe vera skin cream is made from high quality natural and organic ingredients! It contains no parabens or added fragrances and so is gentle enough to use on your kids and babies! Use it everywhere including your feet, legs, torso, hands, arms, and even your face! You’ll receive four 9oz Hawaiian Moon Aloe vera skin cream jars with four free .75oz bonus jars. This quantity is enough to last you for about 1 year, depending on your usage. This is the right amount to buy if you’re purchasing for your family or if you’re treating more than a couple areas. Enjoy these savings over buying by the single 9oz with free .75oz travel jar. And don’t worry about it going bad, our Hawaiian Moon Aloe vera skin cream has an 18 month (1 and a half year) shelf life! Additionally, we back all of the products you find on our website with our 100% money back guarantee! Applying the Hawaiian Moon Aloe vera skin cream is pretty straightforward. Simply dip your fingertip into the jar of aloe cream with the aim of getting a pea sized amount. Once you have a pea sized amount, spread it evenly to the desired area, rubbing it in pretty well with a circular motion. You can do this throughout the day as many times as you’d like. We recommend applying twice daily, once in the morning and evening. Applying immediately after a shower is a plus too! 2nd time I have ordered this Family Pack. It is the best skin cream I have ever used. I suffer from lymph edema in my legs and arm and have very dry skin. I love how this cream makes my skin feel and I swear the edema is less when I use it. My husband had cracked areas on his hands that healed in just 3 days and we had tried everything. I first picked this magical stuff up at a garden trade show. I did not know then that I would never buy a different lotion again! I use this daily and my skin is so soft. I have used it on my dogs hot spots and bam!, they disappear in a few days. This week, my boyfriend got a really bad stye on his eye and he went to the doctor. The doctor prescribed him eye drops. After a week of no improvement from the drops, I randomly thought why don’t we try my lotion. I put it on the first night and he woke up and the stye was significantly better. It only took three days and it was gone! The prescribed eye drops didn’t even work but this lotion did! I literally feel as if it can heal any skin problems. Thank you Hawaiian Moon, I JUST LOVE IT. I play pickleball 4 times a week for the last 5 years. The bottom of my feet became dry and cracked. No matter what I used the dryness and cracking would not go away. My heels were also dry and cracking. I started using the aloe product and within a few days my skin was soft and smooth, My game actually improved because the pain and bleeding around my toes and heels were gone. This stuff is absolutely incredible!!! I have Psoriasis and have used countless other creams, lotions, steroids and nothing seemed to work. My friend gave me her .75 ounce one to try out and I noticed phenomenal results the first day even!! This is life changing I want to try some of their other products to see if any of them have the same results as well. This stuff has literally changed my life, I would barely leave my house before trying this. You may ask yourself, is this lotion/cream really worth the price? and the answer is ABSOLUTELY, 100% YES!! My son suffers from extreme eczema. He has eczema spots on his body that will just not go away no matter what we do (and trust me, we have done everything, including the AIP diet). The same spots have been there for months and months and are so dry and itchy that he will scratch them until they bleed. I saw this product at a convention and thought I would give it a try. At this point, we were desperate. We started using this at bath time and within a week, every single dry patch was GONE. Within 2 weeks, you could not even tell that he has eczema. This is THE BEST product out! I wish everyone knew how amazing this stuff was. A 4 oz Skin Care jar (a 3-6 month supply) of our Hawaiian Moon Aloe vera skin care cream. 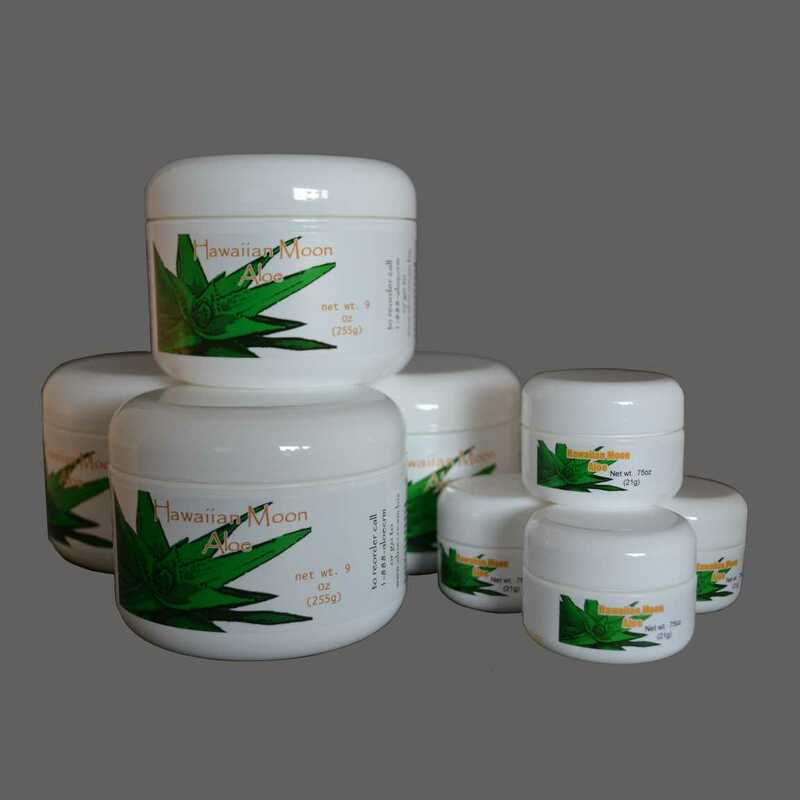 One 9 oz Skin Hawaiian Moon Aloe Vera skin cream jar plus a free .75 oz jar.